Anusha performed twice at Art in Action 2014. Art in Action was “Inspired by the simple principle that people are fascinated when artists and craftsmen openly demonstrate their skills and discuss their work.” Anusha performed a selection of classical pieces. In one of the shows she performed with her friend Sushmita Gosh. Sushmita is one of the finest exponents of Kathak. She is currently the Director of the Kathak Kendra, New Delhi. This choreographic work challenges notions of normal and abnormal, drawing inspiration from Anusha Subramanyam’s therapeutic and creative movement work with people with physical and mental challenges. It is an exploration of the dance that they created, using movement that is raw and sincere – straight from the heart. Anusha also worked at the renal ward of the Birmingham Children’s Hospital, where she used dance to engage with the children and their families, empower the children’s own movement to help them regain an identity beyond that of sick patients. The work uses the emotive and gestural grammar of Bharatanatyam, combining it with movement that is both contemporary and classical. Fleeting Moments is a work conceived by Bishaka Sarker. 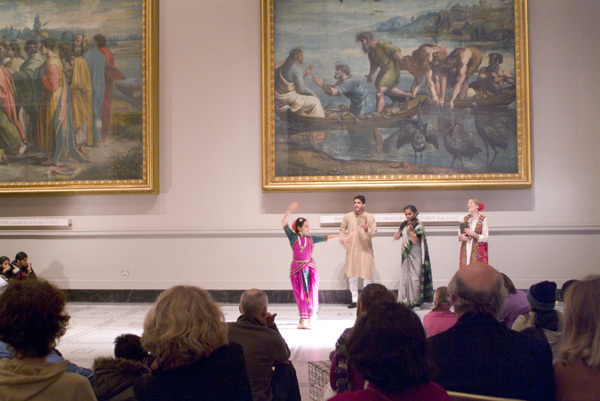 This site specific performance was an encounter between Indian classical dance and the most celebrated surviving artworks of the Italian High Renaissance. Anusha performed infront of two of Raphael’s monumental biblical scenes interpreting and drawing out the stories and characters and enabling the audience to find new life in the painting. Performed in the Raphael Gallery at the V&A during the ‘Encounters’ Exhibition, 2004. These cartoon were painted by Raphael to make into tapestries for the Vatican. Colour Contact was a competitive multi-media dance performance commissioned by the Museum of London for the London Voices exhibition, 2004. Colour Contact explores the city of London and its present history through the eyes of its inhabitants. It draws upon the memories and voices of all those who live work and visit here. These voices were drawn from the oral history archive of the museum of London. It was performed at the Museum of London, Brent Brent Cross shopping centre, Southwark Tube Station and the Ealing Mela. Colour Contact was supported by the Heritage Lottery Fund. Colour Contact is now regular part of Museum of London’s I am a Londoner project. Beeja runs a performance workshop with a school group visiting the museum to explore concepts of identity, belonging, community and engagement in multi-cultural London. Milk White Ocean is a Hindu creation myth. Beeja collaborated with the Wonderful Beast Theatre Company to create the work, which was first presented in the Nehru Gallery at the V&A. 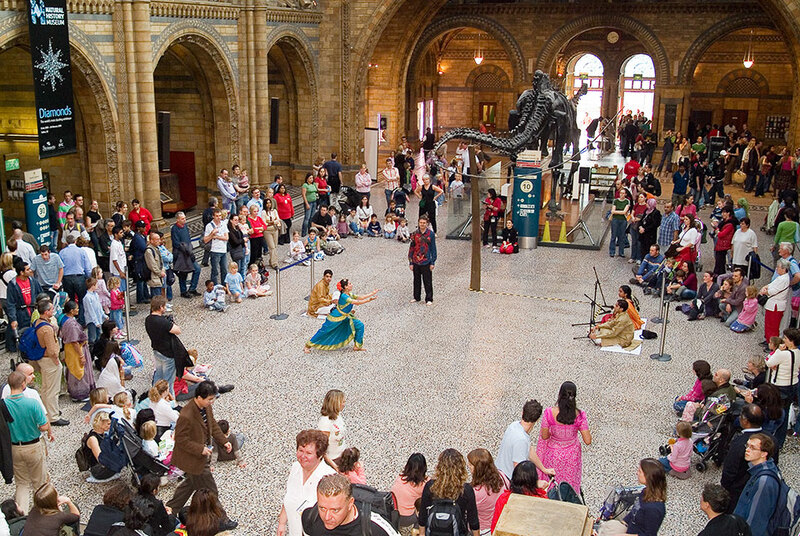 The work was subsequently re-chreographed and performed in venues across London and a dries of shows in the main hall of the Natural History Museum.